The AP 621 is a thin (dependent) multipurpose access point designed to lower the cost of deploying and operating a secure, reliable 802.11n wireless LAN (WLAN) in branch offices or headquarters facilities. The access point features a MIMO radio, superior receive and transmit sensitivity, and a GigE WAN uplink port. The AP 621 is easily managed remotely by a Motorola RFS 7000 or other wireless controller that discovers access points on the network and automatically downloads all configuration parameters and firmware, greatly reducing installation, maintenance and troubleshooting costs. 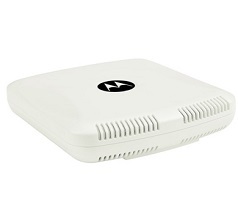 Powered by Motorola’s WiNG 5 distributed architecture, the AP 621 Wireless Access Point offers top 802.11a/b/g/n performance along with direct forwarding, security and QoS services at the edge. Supports both 2.4 GHz and 5.0 GHz frequency bands.